Nowadays our Telco’s started offering DSL (Digital Subscriber Line) with monthly bandwidth limit. Globe is one of the internet service provider that offers this kind of setup where they only you to consume a limited data that renews every month. When you apply for their postpaid DSL Broadband plans, watch out how many gigabytes you can use monthly. Having this kind of setup makes you think how you can limit internet usage. You may start thinking about how to block certain websites that consumes huge amount of data or even allow only devices that you and your family owns. Every Globe subscriber, who applied for wired internet includes a free modem/router with Wi-Fi capable to connect your wireless devices like smartphones, tablets and laptops. 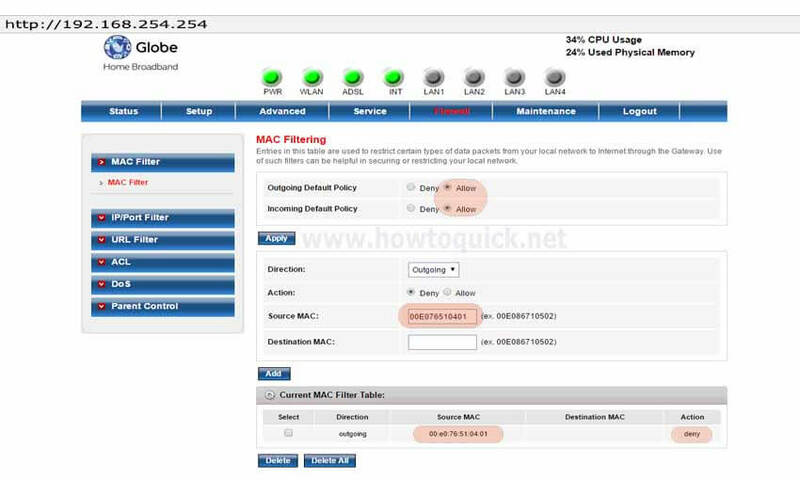 In this MAC filtering tutorial we are using Prolink H5004NK model but this concept will also work on other router models (H5001NS). All you need to know is the idea on how your router firewall settings or configuration work, especially MAC Filter options. 1. Connect to your router / Wi-Fi, open your browser then access the web UI by typing 192.168.254.254. 2. Click on Setup then enter Globe router Default Admin credentials username and password. 3. Go to Firewall tab, look for MAC filter options. Outgoing and Incoming Default Policy must be set to "Allow". 4. 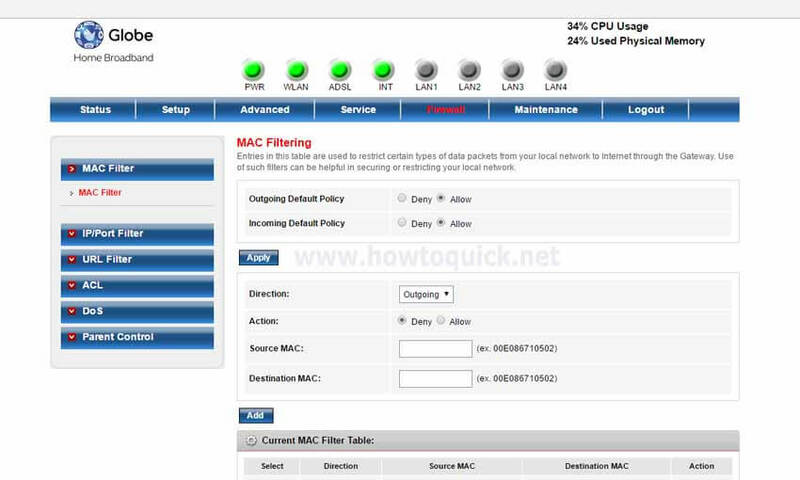 By default policy, settings are configured to allow all MAC address as there’s no rule listed on the filter table. 6. Leave Destination MAC blank or empty then click Add. The rule will appear on Current MAC Filter Table below. Try to browse using the device with the MAC blocked on the Globe router, it shouldn’t connect to the internet. You can test another device with MAC address not listed on deny filter, it should connect to the internet. In this setup, you can control those devices who eats up your monthly bandwidth allowance. 1. 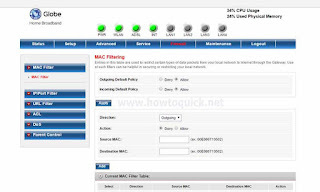 Follow above steps 1 to 2, Go to Firewall tab, look for MAC filter options. 2. Set Outgoing Default Policy to “Deny” and Incoming Default Policy to “Allow”. 4. Leave Destination MAC blank or empty then click Add. Repeat again if you want to add more devices MAC. The rule will appear on Current MAC Filter Table below. Connect a device that is not listed on your allow only rule, it will not connect to the internet. 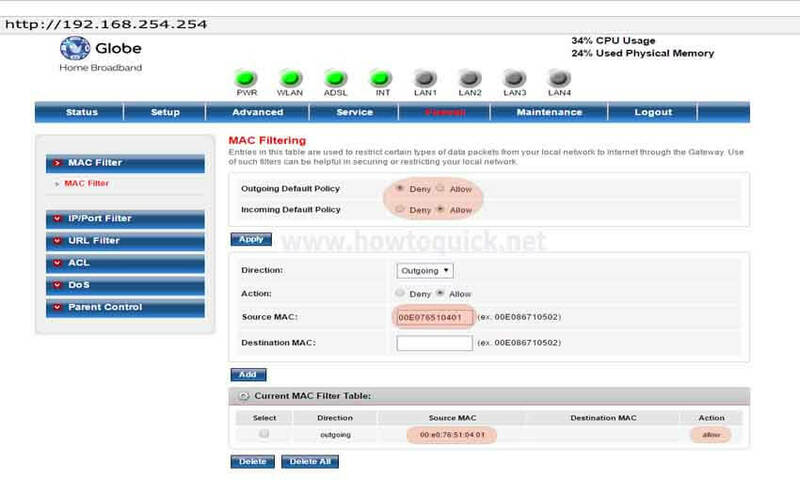 Test any devices with MAC address included on allow only rule, it should connect to the internet. Above settings will apply on both Wi-Fi and LAN connections.